In this series, we have explored how our preferences changed from mid-trail geometries, 700C x 28 mm tires and saddlebags to low-trail 650B bikes with much wider tires and handlebar bags. What will come next? 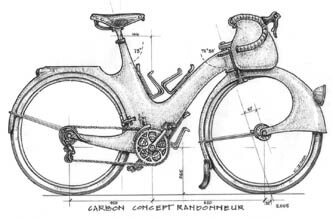 Will we soon ride fully-faired carbon bikes with fenders and racks that form structural parts of the frame (see concept drawing above)? In the last few years, our preferences haven’t changed further, despite riding very different bikes, like the Moulton with full suspension, the Dursley Pedersen with a hammock seat, and a variety of carbon bikes. Have we arrived at (or rediscovered) something that approaches the ultimate form of the bicycle, at least for the riding we do? and most possible combinations of these various factors. While we haven’t ridden recumbents and tricycles, we have studied their performance and found little indication that they would work better for us than the bikes we currently prefer. It appears that our journey of discovery has arrived at its destination. I am now confident that I can specify a bicycle that will remain close to optimal for a long time, rather than becoming obsolete quickly like the bikes we used to ride. In fact, Mark ordered his “new” bike in 2006. In the five years since, the only things he would change are a slightly lighter tubeset and slightly wider tires. (The Grand Bois Hetre 650B x 42 mm tires weren’t available back then.) Mark also changed his handlebars to the Grand Bois Randonneur and installed the latest-generation LED headlight, but those were relatively simple modifications. Compare that to the radical changes our bikes underwent in the five years prior. Of course, everybody’s “ultimate” bicycle will be different. Much depends on where you ride. If your roads are as smooth as glass, then tires wider than 28 mm offer little advantage. If you live in the Atacama Desert, then fenders are of little use, except to protect you from dust. Some choices are about aesthetics. I like lugs, even though a fillet-brazed or TIG-welded frame can be slightly lighter and easier to adapt to various geometries. (Lugs may be better at distributing stresses, though.) Similarly, narrow tires and racing bikes are aesthetic choices that offer few functional advantages, but that have an appeal of their own. At Bicycle Quarterly, we try to provide information on how different bicycles perform. With this information, our readers can make informed choices and form their own preferences. What is your “ultimate” bicycle? Click here to start reading with Part 1 of this series. This entry was posted in A Journey of Discovery, Our Bikes, Testing and Tech. Bookmark the permalink. This is just a quick note to let you know that I have been enjoying your blog. You may be interested to read my blog, “The Philosopher of Cycling.” My latest post presents a little appreciation of Grand Bois tires. This has been a great series, and I’ve learned a little about myself in the process. I’m a new rider with a budget aluminum road/CX bike. My next bike will be steel, able to accommodate wider tires, and will have a few aesthetic touches like contrasting lugs. It won’t be a “Country Bike” or a “Rando” bike. It will simply be a classic road bike with no expectation for racing, but plenty of enjoyment for charity rides and day long tours. My favorite/ultimate bike is whatever I have on-hand to ride, which means whatever I can pack into an airline or UPS compatible box every few weeks. What I most want is a manufacturer other than Panaracer to make a tire comparable to Hetre so I have more than one source for great tires. A wider rim-brake compatible 650B rim (>=28mm) and front bag as robust/feature-ful as Berthoud with a lower weight (i.e. <2lbs) would also be nice. Extra credit for using naval turnbuckle clasps rather than elastic cord or buckles on the bag! Am quite sad to learn that Berthoud have discontinued their excellent plastic/composite fenders. Plastic fenders survive packing cycles much better than metal and weigh only slightly more than aluminum. 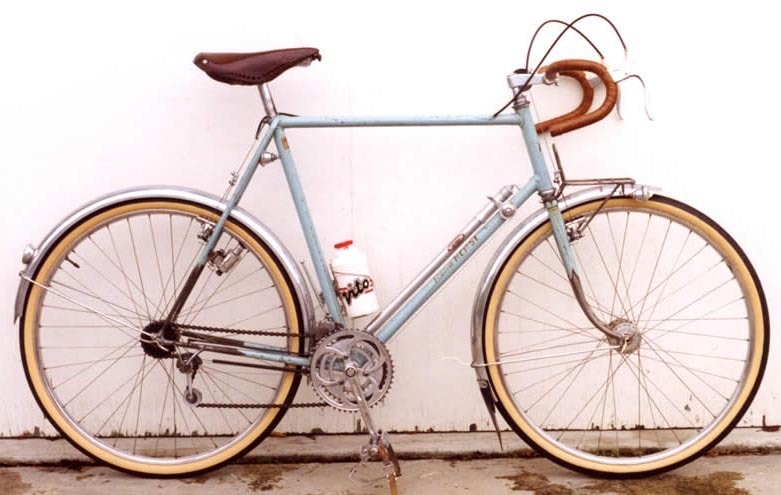 Based on my current, limited experience, my ultimate bicycle would be something like a lovechild of my Rivendell Sam Hillborne and my vintage Bianchi racing bike – with the Rivendell’s wide 650B tires, canti brakes, fenders and racks, and stability, but the Bianchi’s more spirited handling. Why do you not have a 650B randonneuring bicycle of your own, if it has been your favourite bike for several years? Is it a matter of still looking for the right builder to make it, or do you intentionally not own one as you think it might make you biased?.. How is your Grand Bois Urban Bike different from a randonneur? Is it just a matter of having that large front rack installed, or is there something about the geometry/tubing that makes it unsuitable? And on a separate note, I received the new BQ issue last week and found that I wanted to “comment” on the articles – having gotten accustomed to this blog! Funny how that works. The Urban Bike has a much stiffer frame than is ideal for me – it’s a compromise because it was intended to pull a trailer as well. Simply changing the big rack for a smaller one wouldn’t change how the bike feels on long rides. For me, the frame is the most important part – I can live with less-than-optimal handling and tire sizes, if the frame works well for me. We do appreciate “comments” on BQ articles, and publish them in the “Readers’ Forum” section. What happened to that 1952 Rene Herse, the light blue one with the Cyclo derailleur written up in Riv Reader and VBQ Vol. 3, Nos. 2? I thought that was yours. I was lucky to ride the 1952 Herse quite a bit, but it’s not mine. In any case, for everyday riding, it would be limited by the 1952 lights, and replacing wear-and-tear parts on a bike like that isn’t an easy matter. However, it’s definitely one of my all-time favorite bikes, and any future 650B bike will be modeled on it. Your own potential new frame would probably be custom, and after riding so many fine bicycles with known (or strongly suspected) diameter/butting combination you have reduced the potential of making a bad choice when/if it comes time to commission a bespoke frameset. There seem to be very few people with much experience building this sort of project, and even fewer with the depth of knowledge necessary to make good design recommendations for riders of a variety of sizes, weights, and riding styles. From BQ’s great historical context, it seems that a lot of this knowledge did exist at one time (when there were fewer options for building such a frameset than exist today), but this knowledge was never shared. From a theoretical standpoint, the increased variety of tubesets, tooling/measurement/techniques, and materials available now should make it possible to equal or exceed the performance of great bicycles from the past (especially in terms of matching fit/design to the rider). I would be keen to see more analysis of what makes a great lightweight low-trail bicycle (ratios of relative stiffness, stiffness measurements for common tubesets, etc.) and especially like to see more than passing reference made to the tube diameters and buttings in BQ reviews to provide additional points of reference. Some of what makes a lightweight bicycle great also reduces the margin for error, and an under-built low trail bike can be rather disappointing. From a general perspective, the choices made in production frames (which have larger margins for error and cater to a wider variety of riders) vs. choices made for particular successful and unsuccessful custom projects are also of interest. I recognize there is not a formula or universal rule, but more data would be quite welcome! You are right, framebuilders have an almost infinite number of tubing combinations available today. For example, for very tall riders like Ryan, we have found that a thinwall oversize tubeset can work very well. However, the more bikes we ride, the more we appreciate standard tubesets. These tubesets evolved over time and provide a balanced frame (see the article on relative frame stiffness in the Spring 2011 Bicycle Quarterly). In some cases, when a builder changes a tube (say, use an oversize top tube), the end result is inferior to the “standard” tubeset. Reporting on butting lengths, etc., of test bikes is difficult, because we cannot measure these without cutting apart the frame. There is no standard way of reporting these, so asking the builders would not yield consistent results. In the end, a bike test can tell you only so much – how the bike rides in the tested size for the particular test riders – and beyond that, it’s a bit of a leap of faith when you order a custom bike. It would be nice to have a whole flock of testers in different heights, body types and riding styles, and ask builders to submit half a dozen bikes for each test, but this is hardly practical. Most small builders have to stretch themselves just to make one test bike for us. My ideal would be a bicycle that is comfortable, fast, versatile, and durable. Based on your publications and my own experiences, I am convinced a fat-tired road bike with a front bag + low-riders would be ideal. I want a bike that I can load up with a night’s worth of clothing and food and then pedal into the mountains after work, preferably on an old deserted logging road, and spend the night. I also want this bike to be suited for the rides I go on most often, which are mostly paved and mostly in the 50-70 mile range around Seattle. Fortunately, these sorts of bikes are beginning to be more common. Well, of course, though I can’t ride all night! I would take a train to Centralia first. I’m also excited by the coming summer, when I don’t have to haul in multiple sets of clothing and tents on camping trips in order to stave off hypothermia. though I can’t ride all night! Riding all night (and our other endeavors) aren’t superhuman in any way. It takes a little time to build up to long-distance riding, but almost everybody can do it, and it’s more enjoyable that it might seem at first. If I had to keep only one bike it would be the Surly LHT as I can do all my essential rides with it. If I didn’t have the LHT I might build up a heavier duty 650b porteur bike which would carry out the same missions just with a front biased loading. I’m hoping not to ever be forced to keep only one bike. I’d sell my truck, my furniture and my surfboards first! I must say that after finally having experienced a low trail, light steel tube bike with relatively wide tires, I can’t see any reason to return to my other, high trail, relatively thick walled steel tube bikes. I have to admit that I wasn’t truely convinced that everything that I had read in Bicycle Quarterly I would actually experience, but I have, and because of that (even though riding my other bicycles can still be enjoyable) why would I want to ride something clearly inferior? And, of all the ride characteristics that I experience while on a lively, low trail bike with wide tires, I find I appreciate the most being able to corner on a constant radius and make adjustments if necessary in mid turn and having access to my stuff in a handlebar bag along with the incredible stability. I can take my hands off the bars going down hill at 30 mph on rough pavement! Impossible on my other bikes! -a composite frame where each bit had been tuned to my preferences/needs. -integrated fenders, could be structural where beneficial. -integrated lights and perhaps also cyclometer, maybe even usb power station. It would be awesome to have a water bottle with integrated UV purifier, that when put in the bottle cage draws power from your dyno and purifies water while you ride. -Easy lockability for overnight security. -Nice gore-tex clipless shoes that are supremely walkable, look nice, and work well on the bike. -Wool that dries as fast as synthetics, or synthetics that insulate and smell as good as wool. -Quick-release, integrated luggage. Front bag, frame bag, low-riders, etc. -Black fabric that somehow is just as visible as yellow to motorists. -Downhill stoplights that turn green as cyclists approach. -The best qualities of rim brakes and discs combined without either of their respective drawbacks. -cycling cap that protects like a helmet (airbags in hat)? Man, I miss riding without a helmet. The biggest thing I am struck by is the constant pull between ultimate integration and ultimate adaptability. My ideal bike depends on where I’m living and what sort of riding I’m doing. For the paved roads and flat terrain of South Florida I ride now it would be a superlight standard steel frame, a steel fork with imperial blades and low “French” curve, 700x28c tires + fenders, 23mm box rims with Alchemy hubs, NOS MAFAC competition brakes on braze on studs, NOS 3ttt competizione bar with Gimondi bend and a modern Campagnolo 11 speed 50-39/12-25 drivetrain, Time I-Clic pedals. My 2 or 3 hour rides don’t require anymore baggage then jersey pockets and a tiny saddle bag so no racks and moderately low trail. Mike Terraferma is building me a Corsa GT that matches those specs. If I lived in somewhere that included technical descents and or gravel roads in my rides I’d go for a wider tired 650B bike. If my rides where a lot longer I’d add a front rack and dynamo lights. I’ve also been planning a custom commuter. If you can have more then one bike you can change the balance of compromises that constitute a bikes design to optimize it for a specific sort of riding. the ultimate bike for me happens to be my current go-to bike for almost every ride: my 650b Lyon. In 2007, I asked Jeff to build me a go fast bike with low trail able to hold a front rack. at that time, i had read in the rivendell reader about the berthoud bag, and generator hubs. so i had those items locked in. i didn’t think about “planing”, so i didn’t really do much spec’ing, other then I wanted it to fit like my rambouilett, and i wanted it to have lower trail for a carrying a handlebar bag mounted to a rack. Jeff talked me into these new really expensive tire called hetres, because he wanted to use the bike in a show. personally, i was fine with the col de la vies, but, thought, eh, i guess i could try something new. oh, and i got those fancy honjo fenders. you know, the super wide 650b 52 mm ones(now superseded by 60mm). I didn’t honestly know how much i would ride it. sometimes when ordering a special bike, it’s use is reserved for special occasions. I thought i’d ride it on the weekends for the longer rides, but use a less expensive bike for everyday commuting and what not. what i found is that i constantly reach for it when leaving the garage. it has full length fenders, so it keeps me as dry as it can. it has a great lighting system that has evolved over the past 2 years from a shimano 3n-80/straight gauge spokes/synergy/halogen light to a schmidt pumpkin hub/sapim cx-ray spokes/synergy/led light. recently, i have been converted to the 94 bcd crank, which offered a 46×30 chainring setup without having to resort to something drastic/french/french knock off. the rack/bag setup works great(ortlieb hook decaleur on a custom rack). I would really like to think of how this bike can improve for the future, but right now, it’s pretty much ideal. the only question is whether i would like a standard diameter tubeset over the os tubeset i have now. personally, i think my bike works just fine , and while i’d like to try it out, i don’t know if it would be that much of a difference to make me really want to give up the lyon. Knowing Jeff Lyon, he probably built your bike from very thinwall tubing… which “planes” fine, at least for me. Sounds like a lovely bike. A few years ago I was able to purchase my “ultimate” bicycle; one of the last green Heron Wayfarers. At the time, I didn’t really understand trail but now that I do, I would love to have a new fork made with low trail. That would also allow more pedal clearance, which really annoys me. I could also switch to a handlebar bag which I see really is more convenient than my Carradice saddlebag. The bike easily fits 37c tires, maybe 40c, which is nice. This, with the 700c wheels might provide more gyroscopic force than ideal, but most of my riding is in straight lines around Chicago, so it’s not a big deal. And I think it would still be fine for touring to counteract heavier loads. The same for the thick wall tubing, though I am pretty light. Yes, I wished it had internal wiring, but I think the idea of using pin-striping tape that is of a similar color is a very slick way to mount a wire to the downtube. I will also be removing the velo-orange “constructeur” racks and re-installing my Nitto M12 in the front to regain fork springiness. I am currently devising a method to measure how much suspension my Brooks Champion Flyer provides. I’m secretly hoping it doesn’t provide much, as I’ve been envying an unsprung green B17 for quite some time. I also know that Jan is a proponent of the supple 700 x 32 Grand Bois Cypres tire, but I’d like to think I could find a significantly fatter 40c tire that does provide more cushion. Most of the Schwalbe tires provide such strong puncture protection in the form of thick belts, it’s hard to see how suspension isn’t negatively effected. Perhaps it’s more reasonable than I realize to convert the bike to 650B?